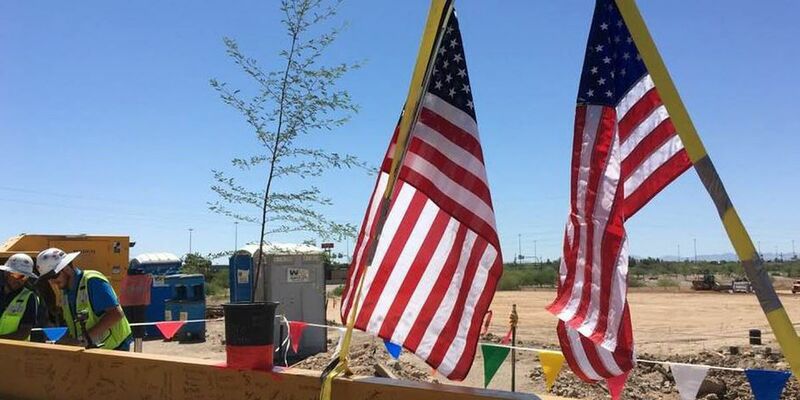 TUCSON, AZ (Tucson News Now) - Caterpillar, which is building a $58 million mining center near downtown Tucson, celebrated a milestone on Friday when the final I-beam was put in place. The outside finished, the company hopes to have the rest of it ready for occupancy in early 2019. Tucson's Ward 1 Council member Regina Romero told the 200 employees and dignitaries that "bringing Caterpillar to the city of Tucson, especially the West side of downtown was an absolute game changer." There is little doubt the companies decision to move to Tucson rather than Denver, or the eight other communities vying for the Mining Center, has changed the economy. "We've seen others follow, we see Amazon, and I think it is directly related," said Fletcher McCusker, the Chair of Rio Nuevo, which was instrumental in convincing the company to come to Tucson and is the principal financing agent. "Had Caterpillar not come, had we not seen the excitement that it has created, I don't think Amazon would be coming." Amazon announced this week it is opening a new fulfillment center on Tucson's east side, and will employ 1,500 workers. Sun Corridor says there will be two more announcements about companies moving to Tucson within the next 60 days. It's a synergy that plays on itself. But for the neighbors, the sentiment is not quite the same. For Lorraine Bartlett, who has lived across the street from where the new mining center is being built, it's a mixed blessing. "Plainly I say, give me three million dollars and I'll sell you my home," she said. "But was doing it in jest." Bartlett says she receives calls frequently from speculators who want to buy her out. "They give me their name, they're interested in buying my home, give me a call back," she said. "I ignore them because I love my home." It's become a sore point, according to others who say some are happy about it but some are not. For decades, Barrio Sin Nombre was all but ignored but because of Caterpillars move next door, they are suddenly the center of attention. All these new homes coming in, the people buying up the vacant land and redeveloping, which is good," she said. "But they're paying so much money for it." She says the neighborhood has been warned about gentrification which she fears is coming and could send home prices skyrocketing, forcing people, out of their homes. "The city is going to have to deal with that," McCusker said. "I think they have the will but they don't have the urgency yet."